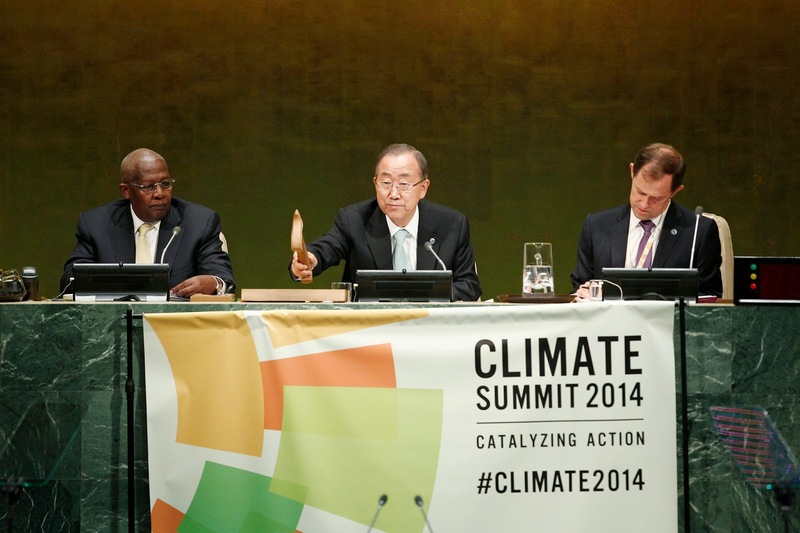 UN Secretary General Ban Ki-moon opens Climate Summit 2014. Photo credit: UN Photo / Cia Pak. Just days after New York City witnessed the world’s largest climate march, in which an estimated 400,000 people marched through the streets demanding climate action, the world’s two largest emitters: US and China, appeared to up their ambition. At the Ban Ki-moon organised climate summit in New York, world leaders met to discuss urgent action on climate change. Former US Vice President Al Gore entered the stage by enforcing optimism about the solutions and market mechanisms at hand, stating that in 79 countries electricity produced by solar power is now cheaper than electricity from fossil fuels. Obama went onto say that the work has begun and the US have begun rapid investments in clean energy. He also said the US’ pledge to reduce emissions by 17% by 2020 from 2005 levels are on track to be met. He revealed that he is directing federal agencies to begin factoring climate resilience into international development programs and investments, and said that the US and China as the world’s two largest emitters has a responsibility to lead in addressing climate change. It was China’s Vice Premier Zhang Gaoli who represented China at the summit. He told the audience that in the last two years China had made progress in curbing their CO2 emissions. He said that ensuring that CO2 emissions peak as soon as possible was an absolutely priority and they would look to bring this about as soon as possible, but did not share any specifics for when that could be achieved, but said China would release post 2020 actions on climate change as soon as they can markedly reduce carbon intensity, increase the share of non fossil fuels and increase the forest stock. Moving forward he said that he would be pushing European Union (EU) leaders to commit to reduce emissions with 40% by 2030. But environmental campaigners might be concerned that he referred to shale gas as low carbon and vital in dealing with climate change. In the UK both Greenpeace and Friends of the Earth have intensively campaigned against the UK governments rush to establish a shale gas industry. Al Gore… “Electricity produced by Solar Power is now cheaper than Electricity produced by Fossil Fuels”… OK, True, But is that a good thing? NO!! WHY? BECAUSE of vast amounts of government $ subsidies, tax credits for Solar Power, and BECAUSE of regulations on Fossil Fuel Power Generating Plants. BUT, because Solar Power is limited to daylight hours, the Fossil Fuel Plants are STILL NEEDED, AND, because the Fossil Fuel Plants cannot operate in the day at full capacity, their EFFICIENCY goes way down, SO their COSTS of production go way up. This means ALL, YES ALL forms of Power Generation COST MUCH MORE, AND THIS IS A HUGE DISPROPORTIONATE BURDEN ON THE LOW INCOME USERS. This also applies to WIND POWER. Coal plants are being located NEXT TO wind power in Germany so there are no gaps in power production when the wind dies down. Al Gore you are so slippery when promoting your hidden agendas.